England have toughened up defensively and are no longer "too nice", according to centre-back Gary Cahill who credits coach Gary Neville with helping to implement the new-found solidity. Roy Hodgson's side will make it a record-equalling six successive clean sheets if they keep out Slovenia in Saturday's Euro 2016 qualifier. "Neville likes being tough to play against, whereby you let the attackers know they are in a game and feel your presence, just by being aggressive and getting tight to them," said Cahill. "It's something we've certainly addressed. We are definitely a lot harder to play against defensively. "It is about being physical and wanting to win the ball back and putting tackles in - the basics of defending, really. I think at the minute we are doing that really well." Ex-Manchester United right-back Neville, 39, won 85 caps in his career before becoming part of Hodgson's backroom team in May 2012 after signing a four-year contract. 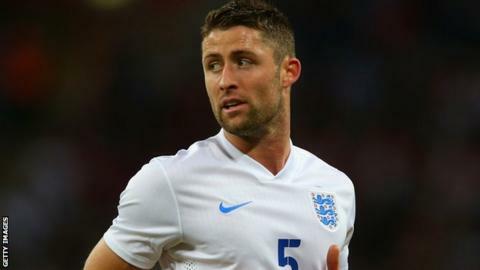 His influence has been positive according to Chelsea defender Cahill, who says he is proud of England's recent defensive record which has seen them record clean sheets against Costa Rica in the World Cup, Norway in a friendly and Switzerland, San Marino and Estonia in European Championship qualification. The Three Lions are top of Group E after three matches, and Cahill believes the team continues to improve: "I think at times we've been too nice, and changing that comes with experience. "It's a big part of the game - knowing when to slow things down, or when not to play from the back. "It's just managing the game really, which maybe we are doing a lot better."